Global Fishing Watch has processed terabytes of data to produce an interactive map of fishing activity and a series of datasets that can accelerate research and innovation in ocean management. 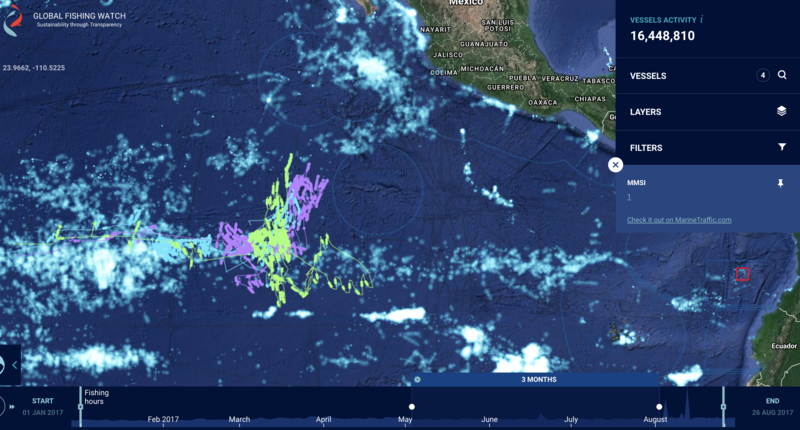 Our map offers a way to see the tracks of commercial fishing vessels at sea in near real-time. Using our freely accessible map, anyone is able to analyze historical data dating to 2012, upload their own datasets to deepen and broaden their own analyses, and save and share their work. Read about the data and technology powering Global Fishing Watch. In the summer of 2017, the government of Ecuador caught a refrigerated cargo vessel, the Fu Yuan Yu Leng 999, for illegally transporting sharks and shark fins in the waters of the Galapagos. At the government’s request, Global Fishing Watch analyzed the ship’s movements and identified four fishing vessels that likely rendezvoused with the Fu Yuan Yu Leng 999 long enough to transfer the illegal catch from their holds to the cargo ship. Global Fishing Watch is committed to processing fishing data and making as much of it freely available as possible. Currently, our key dataset is vessel tracking data from Automatic Identification Systems (AIS) and Vessel Monitoring Systems (VMS), although we are increasingly incorporating new sources such as imagery from NOAA’s VIIRs satellite. Descriptions of AIS, VMS, and VIIRS — the data currently viewable on our interactive map — are available here. We also have other datasets, such as the locations of likely transshipment activities available. Turning these datasets into useful information requires a significant amount of processing. Using machine learning to detect patterns in the data, our team can identify specific behaviours that indicate, for example, when a vessel is fishing and when it might be engaged in possible illegal activities. We incorporate a range of vessel signaling data and are continually seeking to add additional data to fill gaps in vessel tracks and add more vessels to the platform. We are working to make the code that powers these analyses available as well, and we have open sourced some of our key technology. Our data scientists analyzed the movement of refrigerated cargo ships (reefers) to detect potential rendezvous with fishing vessels. 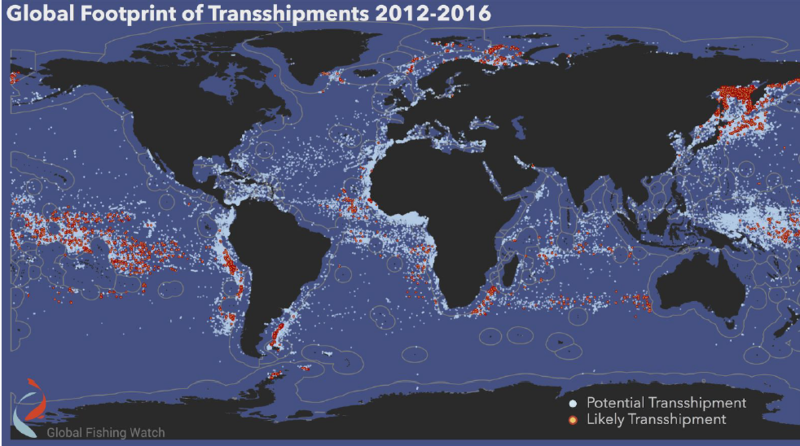 We published their findings in our transshipment report, which identified and mapped more than 5,500 likely rendezvous over a 5-year period. It is the first global footprint of such rendezvous ever published.